So what do you do in the twilight zone between the two celebrations especially if on a two week break? If my emails are to be believed you sit in a darkened room online shopping for all the bargains or if a lover of frantic crowds (retailer’s desire) you shop in person scooping up the offers in the sales. Me, a break from the first feast of richer food than normal. The eating up of the food that remains from festive meals and Christmas presents full of calories. A chance to catch up on sleep and most importantly reflect. Online I am offered the opportunity to participate in #teacher5adayslowchat on Twitter, a chance to think and share about well-being. It is the time of year pre resolutions to look back a year at blogs for #teacher5aday resolutions and #Nurture1415 ideas before drafting and publishing new resolutions with a hint of reality and achieveability, deciding for #1516 how many targets I set to be sensible. I am thankful for the chance to see many of my family in the past few years to meet Doug, a Canadian cousin last met in 2001. As shown in previous posts I spent three and a bit days with both of my sons together – a first in a long time for reasons shared in several previous posts. I will go shopping, I hear a possible washer dryer replacement on the horizon. Visits to favourite art supply shops – it may be cheaper online for some items but I enjoy the wonder of the art retailer. The gym, neglected a lot last week before the new annual surge of members who will have disappeared in many case within a month. How do you spend your betwixtmas? I explained how proud we are to see how the last six months have picked up and how we hope that will continue. Each time I see him my reaction is to hug. This feels like a very special end to 2015 and is hopefully part of an ongoing period of stability. Those of you who are parents may well have many periods with your children where you have felt a particular time marked a good point. Like we have, learn to enjoy these times and hopefully they may be repeated. So since September 29 I have been on a journey of recovery. Many friends, colleagues and family have checked on me and my progress. So since Saturday (seems so long ago) I have been online at different times checking on friends who did the whole or more of the term than me. Why? Because I am well enough to know what I need to be doing so I valued the opportunity to give something back too. So what does that involve? If friends were spotted doing school work, completing planners for 2016, sharing ed resources then I left a post checking on their well being encouraging them to rest. All took it in the context it was intended. Most was at a distance, because we live at one. One opportunity was to take a colleague out sketching – a new hobby for them, I am to blame partly I know. We saw parts of the area they had never been to previously, we sketched and they were able to take some photos too. It was good to do. Another friend it revealed was going through a difficult time and I was able to offer support at a distance but an outlet. I was brought up as practising Christian, I have lapsed since of my own volition, but religion or not I believe in sharing and helping others and the Christmas season especially is a good time when the season’s dark mornings and evenings gets to some. I hope that anyone who reads this has a safe and pleasant time over the next week of seasonal days. If you need to chat say so, I will be taking time out occasionally and can respond. The commercial aspect and religious links attract some but for many it can also be overpowering. I have found it so previously. I am currently in a good place and I hope I can maintain that through the combinations of personalities I will be among. Do what you need to have a calm time. Earlier in the year, in October, I took part in an initiative called #teacher5adaype in which Jonny McLoughlin (Twitter @MrMcLoughlin_PE) provided a month’s programme of exercises. Included were points about hydration, rest, balance and some exercises I have not done in a while. I had just joined a gym as part of my mental health therapy / recovery and became hooked on the ever increasing reps / seconds combination of wall sits, planks and squats. It’s now December, I have been into school so contracted germs of course and was looking for a sensible workout this morning as a spin class was out of the question. I took myself back to those familiar exercises combined with some gym taught stretches and managed three rounds of 60s wall sits, 60s planks and a combination of other stretches – did it hurt? Yes but meant that I could then do some steady cardio on the rowing machine and get back into the gym and feel achievement. All I have to do now is keep exercising through the break pre the New Years resolution crowd joining up. Two weeks ago I started my phased return to the classroom after a 10 week break. Four half days in school. I taught one lesson each visit the first week and two lessons on each in the second week. It was great to be back in the classroom, more so, my classroom even though things have moved around and it still needs that major declutter it hasn’t had yet as other areas of the department were sorted first for others. Classes welcomed me back although I did pause to ask if not listening to instructions how these two actions didn’t quite match. I made classes work on the penultimate day of term – cruel me. Teaching just happened naturally, remembering characters and their individual foibles. I got to mark the two sets of books and get written feedback from them, two way discussion restarted. Essentially I enjoyed it but omg I am so tired and open to germs so I still got the end of term going into holiday germs. When I first return to three days per week I need to work my day, use non contact for marking, planning, take breaks for myself. Leave promptly and build energy levels so that at least once per week I can go to the gym in the evening after a day at work. Work the phased return sensibly and build on the ideas discussed through my phone counselling programme and self reflect each day. Enjoy my time in work and then enjoy life away from work. I have already decided to reduce commitment to outside events but will be attending some meetings, exhibitions, conferences but keeping energy levels and family balance in mind more. Twitter has seen less comment from me- notable as some others have commented on it. At the moment that feels right, we will see longer term how that develops. A release… What is yours? A month ago I started the above, a new and separate mishmashlearning adventure. It is a blog about my sketching, a hobby I have embraced especially since the start of the school summer holidays. Recently while clearing a dusty corner under a desk at home I found an old notebook with three sketches from 2009,2010 and 2011 – 3 sketches in three years did not qualify as a hobby but I wouldn’t have taken the time out to apply myself to developing my skills. I have liked scribbling ideas down, drawing diagrams in the classroom for years. In 2015 I have taken time to discover the restorative qualities of sketching, be it a corner of a rail carriage on the way to London or an architectural detail in a fine building or recapturing the awe behind a photo I took or I saw and wanted to emulate. I have to thank Lucie Golton principally for helping me open my eyes. We have linked online and met now a few times, usually around hunting for large models of Aardman animation characters. 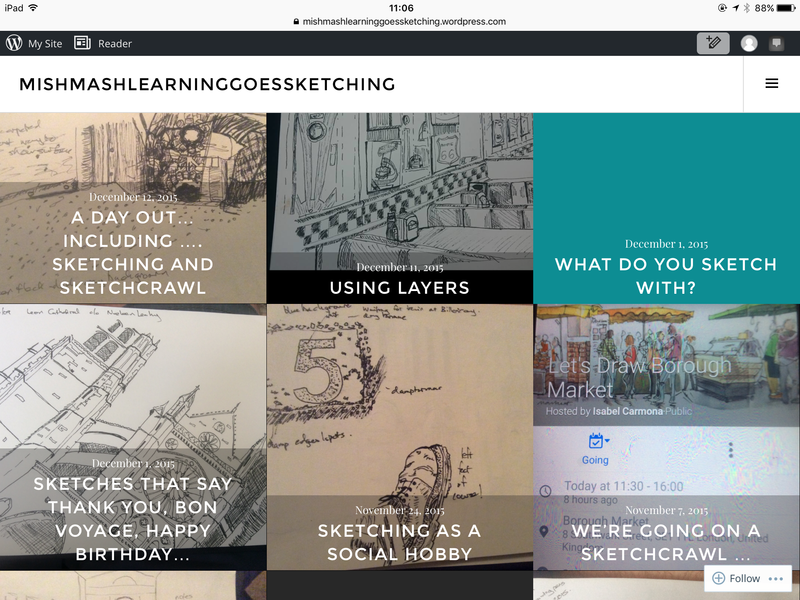 She recommended sketching as a creative outlet and also the group known as Urban Sketchers or come from a broad brushstroke of life to sketch/paint/… live. When I started Lucie reassured me that I would see my output (refuse to use word #work) develop over time. She is 18 months ahead of me. I am now in my sixth month of sketching most days and it has given me a new outlook which I value dearly. Yesterday I travelled to London, drew sketches on a train, in a crypt, out of the National Gallery window looking across Trafalgar Square and then inside the gallery. The other artists came from a wide variety of locations and backgrounds. Amateurs like me upto professional artists who earn their living from it, this is most noticeable when we gather to compare and discuss, if we wish, our pieces. The overriding atmosphere though is a shared love of using art to record. Previous meets have seen discussions on techniques, which paper/ pad /sketch pads to use; equipment – pens, pencils, obscurely name items that I am learning about; where did you purchase said equipment? – comparison of favoured shops / stockists. I am learning a new language and a new shopping habit, I confess I have the full colour selection of Cass bag for life bags (up to date on 12/12 anyway); pencils, pigment pens, alcohol based markers, bleed proof pads, sketch pads with bound or spiral bound spines, erasers, white pencils, art books, …Christmas will see money gifts that will be given for me to develop new techniques like water colouring in 2016. Yes I am hooked. This has become my mindful release. When I am sketching I am absorbed in the task, I am not easily distracted, other worries are left in picking up my sketch tool. 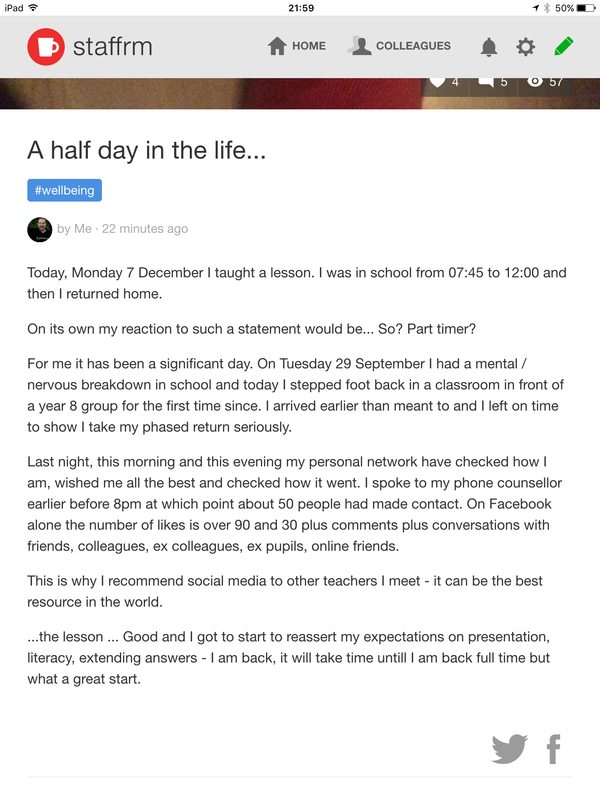 I have blogged about it, talked about it with a range of people especially educators on Twitter. In October I even seemed to have acted at least as one of the inspirations for #teacher5adaysketch which was a great honour amongst a growing community actively promoting teacher wellbeing. The fact that I was signed off work due to my mental health breakdown just emphasised why I needed a distraction that took me away from work. If something doesn’t move it is fair game to attempt to sketch it. What do you do to relax, switch off work, take time for yourself? Please share. London Urbansketchers Sketchmeet yesterday – 2pm photoshoot, picture from Alexa Ramsaroop. A Half day in the life …. Another song link in latest piece in http://www.staffrm.io – posted here as a picture of post.